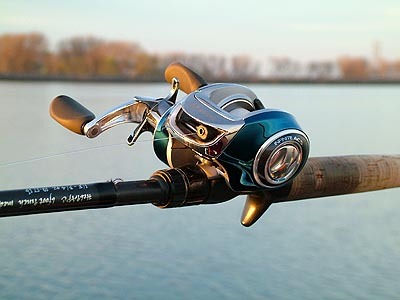 Introduction: Last year we reviewed the new Energy PT from Quantum, complete with the reel�s striking colored titanium deposition coating on the frame itself. Now we have had the opportunity to fully test the company�s top model, the Tour Edition PT. This model is available in both fast 6.3:1 and ultra fast 7.0:1 gear ratios. We take aim at the new �Burner� 7.0:1 to see just how hot this new flagship model really is. 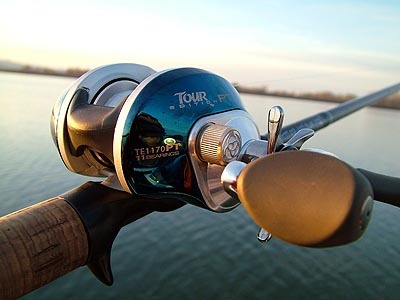 Impressions: Kevin VanDam states "Again, Quantum has designed the ultimate baitcaster in the new Tour Edition PT. The new 'Burner' gears are perfect for my style of fishing," which is a pretty solid endorsement from the power fisherman himself. Power and speed are two things often associated with KVD, and these two attributes can also be associated with the new Tour Edition PT. The Tour Edition PT features a similar Titanium Deposition Coating as the Energy PT, but it isn�t nearly as flashy. Gone are the multi-faceted colors, instead the coating is toned to be a deep lustrous blue. The Tour Edition PT is available in the same speeds as the Energy PT, and comes loaded with a very similar spool and four additional bearings. But the series offers more than just a slight bearing upgrade. At the very top of the lineup is the TE1170PT (and TE1171PT for left hand retrieve) which features a blistering 7.0:1 retrieve. These �Burner� models feature all the latest Quantum technology including all metal components, infinite ACS cast control, polymer stainless bearings, and of course�.Hot Sauce. Casting: First let�s turn our attention to how well the Burner casts. To examine this fully we have to look closely at the reel�s innovative ACS externally controlled centrifugal system. The original concept of centrifugal braking is simple. As the spool begins to rotate, centrifugal force pushes the brake weights along tiny shafts to engage a brake ring, allowing the friction created to slow the spool's revolution. The centrifugal force is the greatest at the beginning of the cast while the spool is rotating the fastest, and lessens as the spool's revolutions begin to slow. We have seen this system, or versions of it on many reels throughout time. The biggest competitor to Centrifugal braking systems is without a doubt magnetic systems, and more recently combo systems which make use of both technologies. One of the biggest advantages of magnetic systems is the ability to adjust the system externally on the fly, the biggest disadvantage is the inability to 100% eliminate the magnetic force placed on the spool. 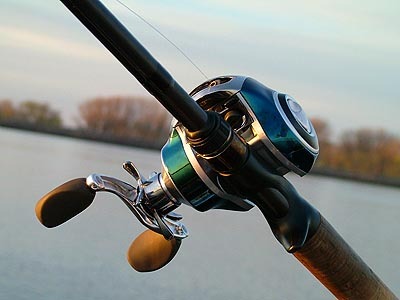 Conversely the biggest advantage of centrifugal systems has always been the consistent performance and reliability, but the greatest weakness has been the hassle of having to adjust the weights by opening the sideplate of the reel. 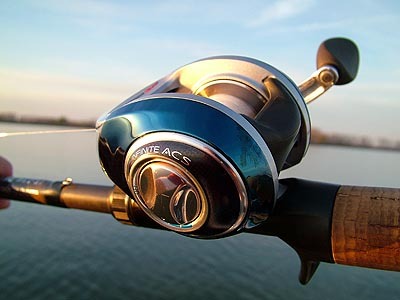 In 1999 Quantum first introduced ACS, an externally adjustable cast control system that allowed anglers to choose 0, 3, 6, or 9 brake weights by adjusting an external dial. 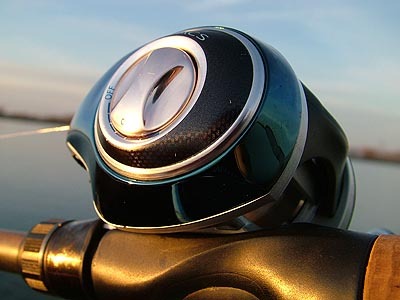 The new system used on both the Energy PT and the Burner is called �Infinite ACS� simply because it gives anglers an infinite number of settings from fully free to fully on (with 9 weights). Infinite ACS is adjusted via an ergonomic knob on the sideplate. The knob can be turned up and down quickly, and our tests confirmed that only does the system work, but it is possible to make extremely precise adjustments to the cast control system, much more so than traditional weighted cast control systems. Once I had the reel dialed in at around 30% I began casting. 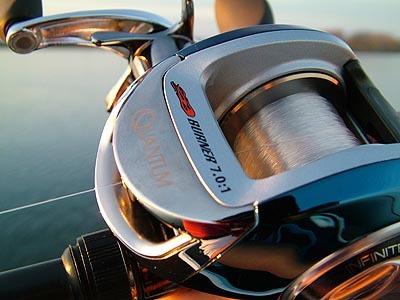 Line peels off the spool smoothly as the reel surprised me by making an enchanting whirring noise during each cast. The casting �whine� is beautiful, and to some extent like a slightly lower pitched Calcutta TE DC cast. The noise emits from with Quantum�s unique ACS system as the weights come into contact with the friction shield. Casting long with this lure is easy, and entertaining. 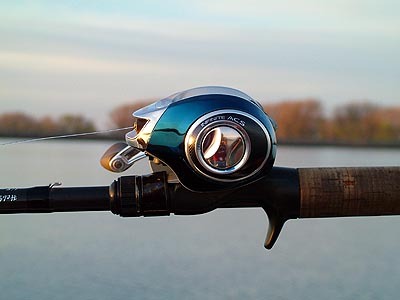 Controlled casting is also made easy by simply turning up the cast control when tossing lighter lures, or flipping and pitching to precise targets. I was able to cast our 1/2oz test plug 100-120feet consistently with a 20% setting on the Infinite ACS. Casting is so easy that I soon became overconfident and backed the ACS to zero and attempted to try and set a record�..unfortunately a second later I found myself face to face with the mother of all backlashes�.yes, this system works, and it works well.